(APN) ATLANTA — Georgia’s Secretary of State Brian Kemp is currently facing at least two lawsuits related to his voter purging practices in the lead-up to the November 2018 General Election. In 2017, Kemp found a way to purge another half a million voters from the voter rolls, continuing his practice of purging eligible voters from the voter rolls that he has engaged in since 2013. Only under the threat of a federal lawsuit, did Kemp turn over the names of over one half million voters purged from the voting rolls in 2017. 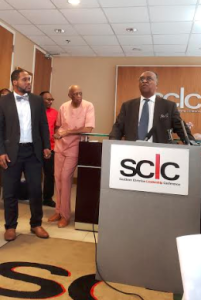 At a press conference on Tuesday, October 02, 2018, members of the Southern Christian Leadership Conference (SCLC), Rainbow-PUSH Coalition, the National Association for the Advancement of Colored People (NAACP), the Georgia Coalition for the People’s Agenda, and the New Georgia Project announced their plans to join Greg Palast, an investigative journalist, to file a federal lawsuit against Kemp. The lawsuit accuses Kemp’s office of using a faulty and racially biased method of removing legitimate voters from the rolls. “We are trying to get in touch with all the people who have been wrongly removed by this crazy crosscheck list which is racially biased,” Palast said. In addition, a second lawsuit filed on Thursday, October 11, 2018, in federal district court by the Campaign Legal Center and the Lawyers’ Committee for Civil Rights under Law, challenges some 53,000 voter registration applications that have been held up in Kemp’s office to due a mis-match. Kemp has said that those 53,000 Georgians are on a “pending” list and are eligible to vote on November 06, 2018. The 53,000 were first reported by the Associated Press. “Many people have died to have the right to vote. Folks like Kemp and others throughout this country think they have a legal right to remove people with certain ethnicities that they don’t want to be part of the process. This is blatant racism,” Dr. Charles Steele, Jr., President and CEO of SCLC, said. Others in the room held similar beliefs. Kris Kobach, the Secretary of State of Kansas, is the main force behind the claim that there are purportedly millions of illegal voters committing fraud in the U.S. by voting twice in different states. The Interstate Voter Registration Crosscheck Program, used by 26 states and administered by Kobach, is the Republican answer to a problem of massive voter fraud that does not exist. It allegedly finds voters with the same name who have registered in more than one state, creating a perceived justification for states to kick them off the voter rolls. Kemp, as well as 26 other Republican-controlled Secretaries of State, sent their entire voter files to Kobach to put them all together and cross-check the names. Crosscheck nationwide has tagged 7.2 million voters suspected of voting more than once. Yet, only four people have been charged with double voting or deliberate double registration, according to a Rolling Stone magazine investigation into the elusive double voters. Palast claims that Kemp took the list of names provided by Kobach, finding hundreds of thousands of Georgians to purge from the voter rolls for allegedly moving out of the State of Georgia, Palast claims. Crosscheck is supposed to check first, middle, and last names; plus birth date and last four digits of one’s Social Security number. But that does not always happen. Often it is only the first and last names checked, which leads to different people with similar names being purged in error. Mark Swedlund, a database expert, looked at the data from Georgia and Virginia. “God forbid your last name is Garcia of which there are 858,000 in the U.S. and probably suspected of voting in 27 states… and if your name is James Brown there are 357 in Georgia suspected of voting in more than one state,” Swedlund said in a Rolling Stone article. “It is an interesting day as we stand here and have a conversation about voter suppression in the birthplace of the civil rights movement,” Attorney Gerald Griggs, Vice President, State Conference of NAACP observed. “We have sued Kemp four time,” Griggs said. In 2015, Kemp’s office was sued by NAACP and Common Cause for illegal purge of thousands of Georgia voters rolls. Over 800,000 Georgians were purged who did not vote for the previous three years. In 2016, Kemp was sued by the Georgia NAACP, Georgia Coalition for the People’s Agenda and Asian Americans Advancing Justice, for blocking thousands of minority voters from the rolls ahead of the presidential election. “We are calling on Mr. Kemp to step aside overseeing this election… to remove the stain of voter suppression from the rolls and the appearance of impropriety with regards to access to November election. Two Secretaries of State has done it before while they were running for Governor to make sure all Georgians can have trust in this election and respect in the outcome,” Greggs said. “The New Georgia Project, SCLC, NAACP, have registered over 300,000 people of color. 1.3 million have been purged from the voter rolls and we believe many of them are eligible to vote,” Nse Ufot, Executive Director, the New Georgia Project, said. “As quickly as we are adding people to the voter rolls, between crosscheck and aggressive purges and the delays in processing voter registration forms, people are being denied access to the ballot,” Ufot said. The lawsuit, filed under the National Voting Rights Act of 1993, seeks to get the entire Kemp-Crosscheck files and to restore the voting rights of thousands legitimate and eligible voters whose voter registration, the lawsuit says, have been illegally canceled. This lawsuit against Kemp is designed to correct this injustice, and will be the first of 26 lawsuit filed against state officials who have used the faulty Kobach purge lists. This blatant Racist must be defeated by all cost.